JAPAN: Sudden spike in TV demand catches out the big names | What Hi-Fi? Most of Japan's TV industry was beginning to suspect it had seen the glory days of domestic sales, with an eco-points scheme last year doubling demand in the run up to the New Year holidays. But now it seems the forthcoming switchover to digital broadcasting, allied to plummeting prices on flatpanel TVs, is creating another demand spike - and it's catching both retailers and manufacturers short of stock. Initial signs were that, as the eco-points scheme wound down, sales were declining from the record levels of late last year, with drops of as much as 50% month on month. It was thought that many consumers had taken advantage of the incentives, offered when trading in an old energy-hungry TV, to get ready for the digital TV switchover, which takes place on July 24th. 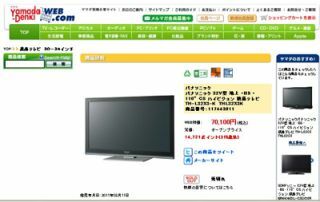 However, now it seems there was a huge untapped demand, and notwithstanding the problems caused by the March earthquake and tsunami, the Japanese are buying TVs like crazy. Sales in June were 150% up on the same month last year, at around 3m units, and the forecast is that they'll hit 4m this month, meaning that the combined June/July sales could equal the record numbers seen in October/November last year. All of which means some retailers and manufacturers, used to heavy discounting to get people to buy Tvs in the wake of the ending of the eco-incentive scheme, have been wrongfooted, and are now struggling to meet demand. Recent discounting has seen TV prices tumbling, especially in the vital 32in sector: prices are some 30% lower than they were this time last year, putting mainstream 32in TV models in the Y30,000-40,000 (£240-300) range. Traditionally mass-market retailers have used TVs as loss-leader to pull in customers, aided by substantial discounts, and that policy has seen, for example, a Sony 32in set on sale at Y40,000, or just over £300, while a Panasonic 32in can be bought for just Y33,000 (£250). That's some serious discounting: just at New Year time we bought a new TV for the in-laws to thank them for their hospitality over several Christmas and New Year breaks - we paid nearer Y60,000 (£450). However, customers taking advantage of these prices now have a problem: they'll have to wait until after the digital TV switchover to receive their new sets, as both manufacturers and retailers struggle to meet the demand, thought to be created by consumers deciding to buy second, or even third, TVs. Some manufacturers are out of stock, meaning customers will have to wait until early August at the earliest to receive their purchases, as the TV makers are reluctant to ramp up demand too much in case sales fall off a cliff again after the July 24th digital switchover. This demand, and the need to keep price-competitive, has led Japan's largest mass-retailer of electronics and electrical equipment to take drastic action. Yamada Denki (above), which has over 2000 stores in Japan, is now selling TVs from LG Electronics, thus giving the Korean company a significant toehold in the lucrative Japanese market.